This pair of part-time Kiwi contract brewers greatly impressed me last time around with a peat smoked beer that had no business being as good as it turned out. Perhaps not a mainstream sort of beer, it nevertheless appealed to my penchant for Scotch and made this jaded beer nerd's heart grow three times larger. As such, I picked up the only other beer of theirs I've run across, their flagship beer, Pot Kettle Black. They call it a porter, but you would probably know it better as a Black IPA (or American Black Ale or whatever the heck you call that style) So let's find out why the eponymous Pot is such a goddamn racist hypocrite, shall we? Beer Nerd Details: 6% ABV bottled (11.2 oz). Drank out of a tulip glass on 3/23/13. Where did you find this one? It's been on my list for a while, but so far I haven't seen it anywhere. Yeah I'm about a mile from State Line. 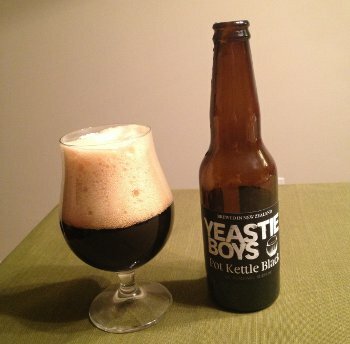 I haven't seen anything from Yeastie Boys the last few times I've checked the NZ/Aus section. I'll have to ask next time I'm there. This page contains a single entry by Mark published on April 1, 2013 7:46 PM. Williamsburg AleWerks Bourbon Barrel Porter was the previous entry in this blog. High Water Old And In The Way is the next entry in this blog.